Fact: I am addicted to TV Shows. As of right now I would have to say without a doubt that Gotham takes the top spot. It is by far my favourite show and hence I'm going to review it for all you wonderful people. However before I start I have a few announcements I guess. Firstly I have decided that once a week blogging just isn't enough for me but if I am going to blog twice I figure I have to have some sort of schedule. So I have decided that Mondays will be my day to posts anything I want, whether it be a personal post or a TV review or even a recipe review and Thursdays will be my day to post a cosplay or beauty related post! So make sure you watch out for my twice weekly blogs! Secondly I just want to thank everyone and anyone who reads or views my blog, I never thought I would actually have people wanting to read what I have to say so it really does make me all warm and fuzzy inside. Now that I've covered that let's get to the good part. I have been watching Gotham for quite a while now, since it started to be exact and I can not fault it. There has not been an instant when I found myself not enjoying the show or not wishing for the week to hurry up just so I can sit down and watch the next episode! Honestly, having to wait a week is the worst! 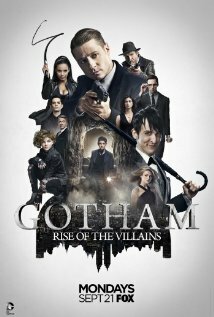 Everything about this show has me in a constant state of awe from the amazing character building to the magnificent atmosphere the town of Gotham seems to uphold. Season One was incredible but I find myself even more in love with the second season. Rise of the Villains has taken on a much darker (who knew it could happen?) atmosphere and I feel like it has really taken on the comic book effect! I honestly have been thinking about this all day and cannot pick one favourite character, I can however choose a top 3. Those being first and foremost Edward Nygma, James Gordan and Victor Zsasz. I am currently absolutely loving the portrayal of Riddler, I love that they are basically showing the beginning of each villain and each episode I find myself reaching for my DC Comics Encyclopedia to find which one has been entered into the story line next. As for James Gordan well he is just ruggedly handsome and an all round good guy and I love what he stands for. I love that he wants to be good but knows that sometimes bad things have to be done. And Zsasz, well he's just a badass haha. Now as for my least favourite character, I once again don't have one I really dislike so I have tried to pick 3 of my lessor favourite characters. Bear in mind this was extremely tough to do, firstly we have Bruce Wayne, now don't get me wrong I think the actor is doing a fantastic job portraying him, however I do just feel like obviously he is a teenage boy acting on emotions and hormones and it just bugs me that he doesn't see the little things in plain sight. Secondly I would have to say Barbara Kean, purely because they have strayed so far off the story line of her actual character, however my partner did inform me that Barbara's maiden name wasn't Kean so maybe it's not her? Lastly I would have to say Tabatha Galvan as I just feel like she has had no character progression but I do hope she gets more in the future. I'm really super excited to see where Gotham is heading in the future and I really do hope it has many seasons to come. The one thing that I am extremely looking forward to is Harley Quinn coming into the story line but that might not be for a while yet. I'm also excited to see what they do with the Joker story line as that did not play out how I thought it would. I really did like Jerome! I thought he had great personality and flare! Anyway guys, I better leave it there or I won't stop writing and that won't be fun! Hopefully in a few more months I might be able to write a follow up review on my thoughts and hopes for this wonderful TV show.